Fayette Pain Management Center is excited to announce that Dr. Nisheeth Pandey will soon begin providing balanced pain management starting Sept. 5. Dr. Pandey is excited to join the program’s existing providers, Dr. Raj Swain and Tim Mellish, PA.
“We are confident Dr. Pandey will be a great asset in our work with Pain Management Group (PMG) to expand our reach of balanced pain management to more individuals suffering from acute or chronic pain in our community,” said Mike Diener, Fayette County Memorial Hospital (FCMH) CEO. Dr. Pandey is fellowship-trained in interventional pain management from the Icahn School of Medicine at Mount Sanai in New York, where he also completed medical school. He is board-eligible, completed his residency in anesthesiology at New York Presbyterian Hospital, and is an active participant in affiliations advocating for balanced pain treatment. “Through offering advanced treatment options and creating individually crafted care plans, I look forward to investing in the needs of the community to responsibly manage acute and chronic pain,” says Dr. Pandey. Dr. Pandey will diagnose and create individualized treatment plans for patients based on a number of considerations, including the cause and level of pain. Conditions treated at the Fayette Pain Management Center include acute and chronic neck and back pain, headaches, fibromyalgia, chronic pelvic pain, Complex Regional Pain Syndrome (CRPS), nerve damage, as well as pain associated with arthritis, muscle spasms and shingles. For more information, call the Fayette Pain Management Center at 740-333-2755. Fayette Pain Management Center is located in Medical Arts Building 1, Suite 106. 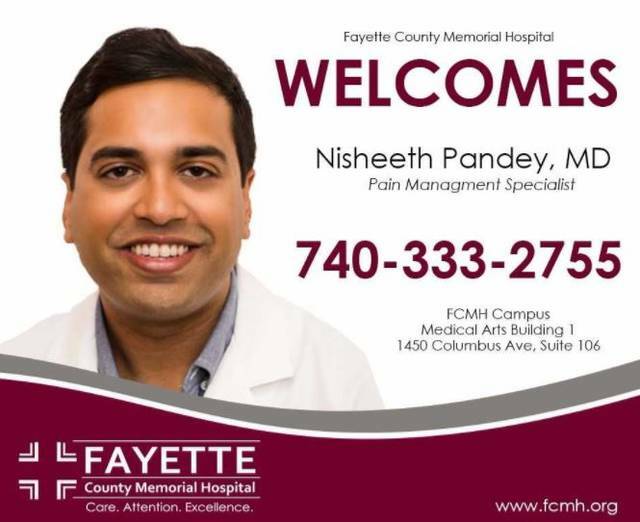 FCMH welcomes Dr. Nisheeth Pandey to Fayette Pain Management Center.